The delay in the proposed construction of KNPP’s 3rd and 4th reactors is likely to seriously affect India’s energy security so needed for country’s growing economy. As Russia and India are highly engaged in fine-tuning the agenda of the regular annual summit talks between Russian President Vladimir Putin and his Indian counterpart Dr Manmohan Singh, now postponed to December 24 in New Delhi, it has increasingly become clear that much-hyped issue of the construction of the 3rd and 4th reactors at the Kudankulam Nuclear Power Plant (KNPP) in Tamil Nadu, will come up as the most important item for negotiations between the two sides. The resolution of the issue of the KNPP’s 3rd and 4th units have become so urgent that it requires all the reserve of the “personal political chemistry” and “political acumen” of the two leaders to sort out the unexpected problem arising from India’s insistence to apply the civil nuclear liability law to these reactors. If the sides fail to make a breakthrough in finding an immediate mutually acceptable solution, it may cause further delay to implement the “roadmap” for the expansion of bilateral civil nuclear cooperation in the future. The “roadmap” for the construction of about 16-20 reactors with Russia’s assistance was approved during the-then Prime Minister Putin’s visit to New Delhi in 2010. The delay in the proposed construction of KNPP’s 3rd and 4th reactors-and thus the “roadmap”- is likely to seriously affect India’s energy security so needed for country’s growing economy. Under the “roadmap,” it is planned to increase the production of nuclear energy from 4,780 MW to 63,000 MW by 2032. Currently, nuclear energy is gradually increasing its share in the installed power capacity in India. Seven nuclear power stations are under construction. Russia is building nuclear power reactors 1 and 2 with the installed capacity of 1000 MW at Kudankulam. The first unit of the Kudankulam is ready to be launched soon and the second unit is at an advanced stage and would be launched during the next year. The formal commissioning of the units has been delayed due to ongoing protests by anti-nuclear activists. 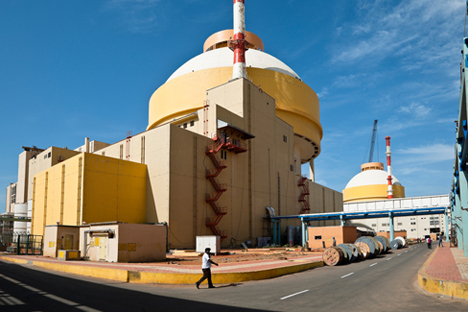 The vexed problem with KNPP’s 3rd and 4th reactors cropped up as result of the approval by Indian Parliament of the Civil Liability for Nuclear Damage Act in 2010, which allows the nuclear operator the right to demand compensation from a supplier in case a faulty equipment causes an accident at a nuclear power plant. India wanted to bring the proposed units 3rd and 4th to be constructed at Kudankulam power plant, under the purview of the civil nuclear liability law. But Russia objected to the application of the civil nuclear liability law to these units, demanding that the same terms and conditions of KNPP’s units 1 and 2 should also be applied to units 3 and 4. India chose not to apply the civil nuclear liability law to units 1 and 2, arguing that they were constructed under an original 1988 agreement - long before the 2010 Civil Liability for Nuclear Damage Act. The bilateral agreement on KNPP’s units 1 and 2 puts the onus of any liability on the operator and there is no provision in it for recourse to suppliers. India also said it wanted to apply civil liability law to units 3 and 4 because any exemption would mean discrimination against companies from other foreign countries constructing nuclear power plants. India has signed agreements with the US and France for construction of reactors. It is also considering a South Korean offer to build nuclear power plants in the country. Indeed, the issue which has rather become a sticking point in the further cooperation in the field of the civil nuclear energy, came up for discussion during the 12th meeting of the Indo-Russian Inter-Governmental Commission on Trade, Economic, Scientific, Technological and Cultural Cooperation (IRIGC-TEC), earlier this month, in New Delhi. Russian Deputy Prime Minister Dmitry Rogozin, who looks after defence industry, co-chaired the meeting with his Indian counterpart S.M. Krishna. “We did discuss the preparatory work for the units 3 and 4 of KNPP. Further techno-commercial agreement is still being negotiated by our experts and I have no doubt that we will come to mutually acceptable resolution of the issue,’’ Krishna told reporters at a joint press conference after the meeting with Rogozin. Rogozin made it clear in New Delhi that if units 3 and 4 were brought under the purview of the civil nuclear liability law, the prices for reactors would go up. “These are contracts with big money, one has to respect the rules. If there are issues that require additional assurances, then it will require additional money” Rogozin said, indicating Russia could insist on increasing the prices of the units 3 and 4, if India insisted on its demand for sticking to civil nuclear liability regime. He also criticised the role of Western countries in the development of Indian civil nuclear energy for whom India was so much concerned to set a level playing field. “Now those same countries finally consider India as a long-term partner and have radically changed their position, but one should not forget about the role of the West’s purely opportunistic and selfish approach. What has occurred in the past may happen again,” Rogozin said in an interview to Russian daily newspaper Rossiskaya Gazeta. He also said the construction of the first two VVER-1000 reactors at the Kudankulam was launched under the operating terms of international sanctions that were imposed on India, and the Russian side agreed to provide extremely favourable financial conditions for the construction. “Russia proceeds, first and foremost, from its international obligations, and from the 2008 bilateral agreement that it has with India, which gives a clear answer to this question. In my view, unilateral attempts to review individual elements of the contractual and legal framework, the introduction, post factum, of additional requirements, in violation of the agreements, will not help in finding a compromise,” he said. “I believe, comparing Russia with other countries in this case is inappropriate and incorrect,” Rogozin noted in his interview. India and Russia signed a protocol in July this year in Moscow on KNPP’s units 3 and 4 to extending a credit line of $3.4 billion, payable in 14 years, from the start of the power generation, at 4 percent interest annually. It is estimated that the total cost of these two reactors will be $6.4 billion. If India decides to apply the civil nuclear liability law to these units, Russia may not only demand escalation of prices for the reactors, but also seek a change in the conditions for the credit line being provided by it to build them at Kudankulam. The 2008 India-Russia agreement for KNPP’s units 3 and 4, is essentially an extension of the agreement covering units 1 and 2. Prices have been derived for units 3 and 4 using the earlier prices as a basis. The loan agreement is also based on the earlier pattern. “Having lived through the accident at Chernobyl in the late 1980’s, Russian nuclear scientists learned clear lessons from it,” he said, stressing Russian reactors supplied to India were “state-of-the art” and there need be no fears over it. Rogozin said the negotiations on the proposed construction of KNPP’s units 3 and 4 were in the final stage and expressed the hope that after having settled a number of outstanding issues, which will certainly be done, the signing of the documents for the construction of the 3rd and 4th power generating units will take place.